This is the overskirt of a dress worn by Betsy Vivian (b.1819) for her marriage to William Gibson Craig in Swansea, August 1840. It was made from long rectangular strips of silk net individually embroidered with appliqué floral motifs, which have then been joined together with narrow machine-made braid. 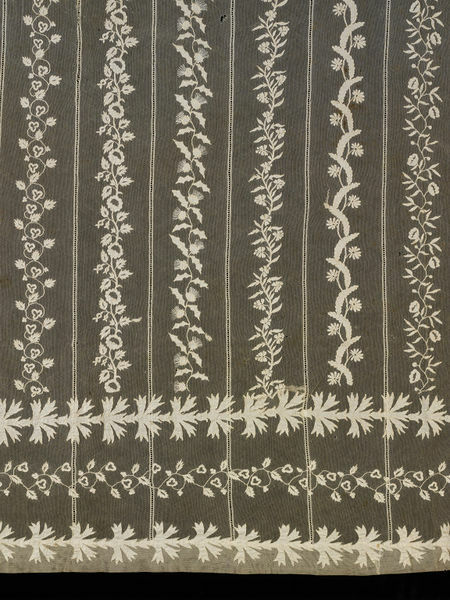 The embroidery technique, using tiny pieces of semi-sheer cotton lawn, is called Carrickmacross work, and was first developed in the early nineteenth century. When Betsy and William’s daughter donated the skirt to the V&A she told us that her grandmother, Betsy’s mother, made it. Whilst the skirt is very beautifully done, the strips of net are of slightly uneven widths and the appliqué work down each strip is not always perfectly centred. The randomness of the pattern and some tiny flaws in its laying-out are also signs that it is not by a professional embroiderer. 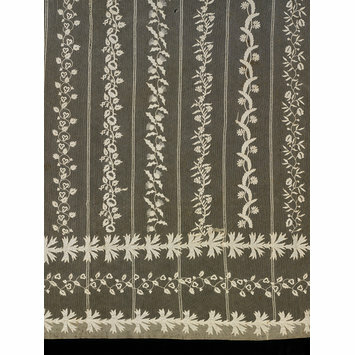 The variety of floral motifs in the embroidery, including at least nine distinct flowers, is notable. The family story was that the skirt was made before Betsy knew who she would marry, so her mother embroidered English roses, Irish shamrocks and Scottish thistles into it in case Betsy’s husband came from outside Wales. Lily of the valley, roses, daisies, unidentified flower, thistles, shamrocks, roses, daisies, lily of the valley, roses, unidentified flower, shamrocks, roses, thistles, unidentified flower, daisies, roses, unidentified flower, shamrocks, roses, lily of the valley, unidentified flower, roses, unidentified flower, thistles. The bottom of the skirt is encircled with two bands of applique leaves flanking a narrower band of shamrocks. The story goes that this was made by Mrs Vivian of Singleton Abbey, Swansea, for her daughter Betsy's marriage in 1840. She started making this skirt soon after her daughter's birth in 1819 and it was first worn in 1840 for Betsy’s wedding to William Gibson Craig in August 1840, Swansea.. The motifs on the skirt included English roses, Irish shamrocks and Scottish thistles, which, family legend has it, were selected in case Betsy married a man from outside Wales so that flowers representing his nationality would be present in her wedding dress. 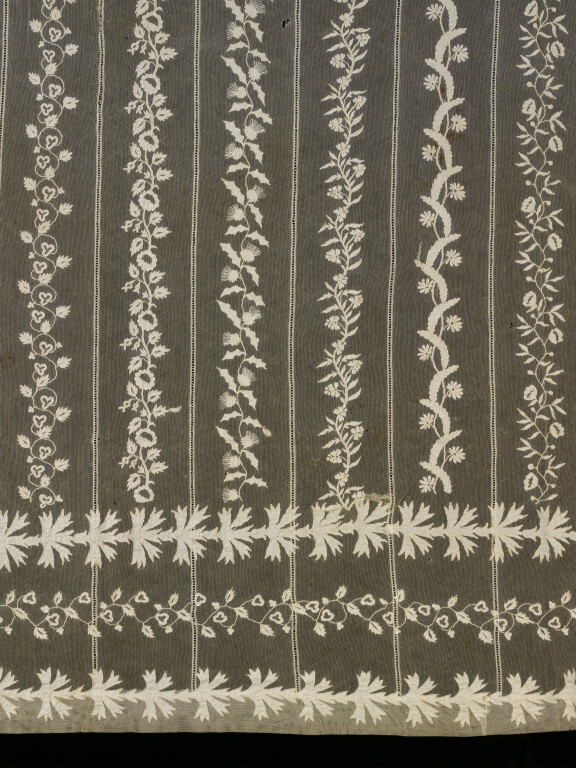 However, these floral motifs are typically found in fabrics and designs of the period, meaning that the story might be family lore. The donor was the grand-daughter of the embroiderer and the daughter of the bride. Clare Browne, curator of lace at the V&A, has looked at this and while it is not impossible that the skirt could date from the 1840s, she questions whether it could have been worked in the 1820s and 1830s. The story of it taking 19 years to make is possibly exaggerated, though the skirt certainly appears to have been made by a talented amateur rather than a professional. The strips of net used in its construction are of slightly uneven widths, and the appliqué work down each strip is not always perfectly centred. There is also no repeat or apparent pattern to the order of the design. Also present are some small flaws in the laying out of the pattern which would not have been acceptable if the skirt had been done professionally, and support the story that the skirt was made by a family member.